Let’s face it. When you drink beer from a bottle, it can be a bit annoying to get the cap off (it it’s not a twist off). A few years ago, we were visiting B’s family and his mom had one of these Bottle Poppers. Let me just say, this is the coolest solution to opening bottles. You put this little plastic thing over the neck of the bottle, press down and voila! Your bottle is open! It’s like magic! We have been looking everywhere for one of these bad boys, but a closer look on the popper revealed a website. 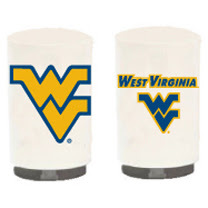 It’s actually pretty rad and they have a WVU one! Even more awesome – you can buy two of these (one for you, one for me!) for under $20!